The 1960's offered a broad array of watches - more than any other decade. There were electrics, automatics and manual winders. There were models in solid gold, gold-filled, gold plated and stainless steel. Dial options ranged from very plain to ornate textures with multiple colors. There was something for everyone, it seems. 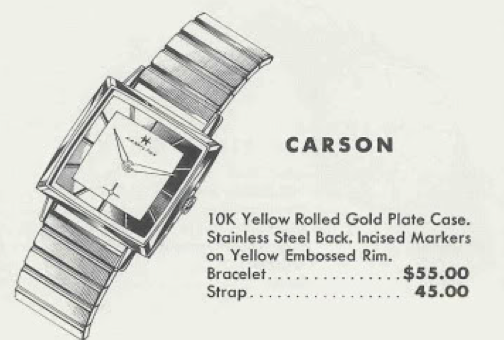 A good example of an unusual 1960's watch is the 1960 Carson. It was the second model to bear the Carson name and it was produced for three years. The Carson came in a 10K rolled gold plated case with a stainless back. The dial is white with a yellow gold embossed band / rim but you'll also find white rolled gold versions with a silver-colored theme. You'll also find later Carsons have a cut-away for the second hand, while the early Carsons have a straight line across the bottom of the gold rim. Under the dial you will find Hamilton's 17 jewel Swiss-made 673 movement. I just received a Carson project watch and it had a number of issues. First, you might note that the crown is missing. I have it, it's just that the stem broke off inside the movement. The hands are an incorrect "baton" style… they're okay but a nice set of pointex (aka alpha) hands would be better. The crystal is also heavily beat up. And finally, the case back falls out of the front very easily - so I'll need to figure out how to tighten that up. Oh, and I suppose I should get it running too. Here's a shot of the 673 movement. There are actually different sized 673's out there and this is the larger 11.5 ligne version. Basically the outside of the movement comes in different chamfers so you need to be careful is you intended to swap 673 movements and make sure you get the right size. A new stem is needed for this watch which means it needs to be trimmed to the correct length so the crown rests in the right place against the case. I'll do that after I get everything else working correctly. Getting the movement to run well was harder than I thought. I had to ultimately replace the pallet fork - I couldn't tell what was wrong with it but it wouldn't run cleanly until I replaced it with a spare. Then it was just a matter of regulating the hairspring - as shown below. The screen represents about 30 seconds of run time and the different angles of lines reflect me moving the regulator. The left side of the screen is where the watch leveled out at 17 seconds fast per day. And here's the finished watch, with a new crystal and appropriate hands. It looks a lot better with a crown too. And best of all - it works! Do you still have this watch or has it been sold?